After 32 days, and a number of important victories, the sit-in that kicked off a wave of escalated nationwide campus action concluded with a rally on Monday. It’s been a big spring for the fossil fuel divestment movement. After 32 days, the sit-in that kicked off more than a month of escalated action on campuses across the United States concluded with a rally on Monday — and with plenty to celebrate. 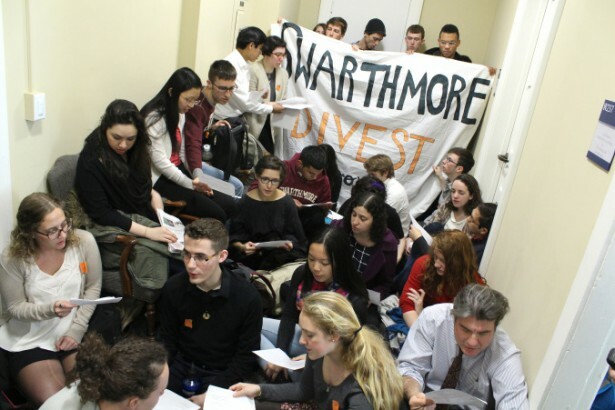 Nearly 200 Swarthmore students and even more faculty and alumni allies participated in Swarthmore Mountain Justice’s occupation for fossil fuel divestment, as marked by a sign-in sheet posted on in the school’s administrative building, Parrish Hall. As reported in Waging Nonviolence last month, Swarthmore’s sit-in was one part of a broader, movement-wide spring escalation, coordinated by a body known as the Escalation Core — a joint project of the Divestment Student Network and 350.org. Many other campus campaigns also took up nonviolent direct action this spring. Nineteen students were arrested for trespassing at Yale, as were another three at the University of Mary Washington, where students from schools across Virginia carried out a prolonged building takeover. Seventy activists with Divest Tulane occupied their school’s administrative offices last week, along with students at the University of Colorado-Boulder, Wesleyan College and those involved with an earlier, similar action at Bowdoin College in Maine. Running across these demonstrations has been a unified question, asked by campaigners to their administrators and boards of trustees: Whose side are you on? Since the escalation began, there have been a number of markers of success for the movement, if not outright victories. At Swarthmore, faculty voted overwhelmingly for a resolution in favor of divestment last week. According to Blazevic, this is the first time such a resolution has been passed at the college since the Vietnam War. At the end of March, Syracuse University announced that it will divest its $1.8 billion endowment from coal, oil and natural gas, the movement’s largest single campus commitment yet. Scotland’s Edinburgh University will divest from coal and tar sands, and faculty at University College London and SOAS in the United Kingdom have called on their administrations to leave behind their fossil fuel holdings. Conservative author George Will even penned a Washington Post column defaming the movement, which — like the round of industry-fueled backlash earlier this spring — can only be a sign that the movement is doing something right. A number of movement leaders and allied organizations voiced their support for the spring actions, including United We Dream and Elandria Williams of Highlander Research and Education, as well as civil rights veteran (and Waging Nonviolence columnist) George Lakey. Public figures and celebrities such as actor Edward Norton and U.N. Climate Chief Christiana Figueres have also lent their support to the movement in the last several weeks. As students head into finals period on campuses around the country, they can study and write papers knowing that they’ve launched the fossil fuel divestment movement into a more militant, confrontational phase. Perhaps less comfortable will be the university Boards of Trustees, returning to campus for quarterly meetings in the coming weeks, now under more pressure than ever to ditch holdings in dirty energy. Even as the sit-ins draw to a close, the divestment movement at large is just hitting its stride.